Abandoned store in Telegraph, Texas. Telegraph is a ghost town in Kimble County, Texas on State Highway 377. The town's unique name, part of the mystique surrounding Telegraph, is found only on a pair of road signs surrounding a combination post office and general store. Faded Post Office Marquee - Telegraph, Texas The Kimble County landmark was named for a nearby canyon where trees were cut for telegraph poles in the mid 1800s. The telegraph connected a string of U.S. Army military bases nearby, leaving the town with an odd name. It's quiet in telegraph, even though it's just 15 miles from I-10. Mule deer sprint across the two-lane highway, not expecting cars to travel through their domain. 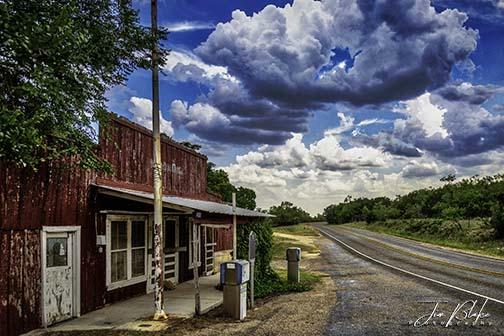 This stop along the Texas Pecos Trail gives U.S. Route 377 travelers a brief history lesson about Telegraph. The post office was established between 1890 and 1900, still retaining its rustic charm and clutter from a century of service.